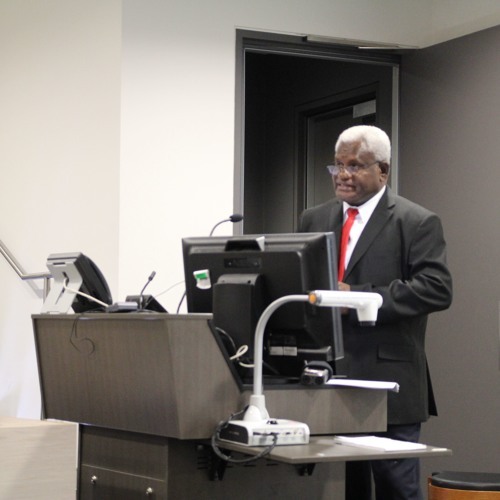 The Honourable Malakai Tabar MP discussed the issues and challenges that Papua New Guinea is currently facing in the higher education sector, and the reforms underway. In 2007, The Hon Malakai Tabar MP was elected Member of Parliament representing the Gazelle Open Electorate. During his first term in parliament he was in Opposition, and was appointed Shadow Minister for Agriculture and Livestock. In 2012, he joined the Goverment through the National Alliance Party and in 2014 he was appointed Minister for the Department of Higher Education, Research, Science and Technology (DHERST). Mr Tabar visited Australia to participate in the ANZ | PNG Gender Parity Symposium, held from 13- 15 October in Canberra, Brisbane and Sydney.